Times a’changing and folks are keener on eating local than ever before. Did you know that the food you eat travels close to 2,000 miles to get to you? And, that vegetables and fruits are nutrient powerhouses – when freshly harvested, the nutrients are locked in – but when they go that distance, they’ve already lost quite a bit of their nutrition. Plus, there’s storage, gas, and other energy used to get it to you. I tried to find a definition of local and hyper-local foods but came up empty. One reference as I was digging around stated local food is that which is grown within 400 miles of the consumer. Yet, what I found on the USDA site is that unlike organic food, there is no legal or universally accepted definition of local food. Most of us consider the distance to be much shorter between us and the farmer as in within the state or region. Hyper-local points to an even tighter range than the local definition. 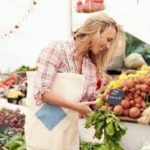 If you’re privy to a farmer’s market or have a CSA share, that’s hyper-local – produce, meats, fish, eggs that farmers produce within a couple of hundred miles from your residence. Most of these farms adhere to organic farming disciplines yet may not wish to pay the exorbitant fees or spend the amount of time and effort required to be considered an organic farm. Yet, strike up conversations with them – they are proud of their offerings and may launch into more detail than you’d bargained for in describing their practices. In the Boston area, Flour Bakery, Henrietta’s Table, Mei Mei and the Flatbread Company are just a few who subscribe to local food practices as they make their selections for ingredients to make their speciality. Boston’s 10th Annual Local Food Festival is September 15th this year at the Greenway and will certainly fill your senses with wares from locals. Taste – lovingly tended and harvested at ripeness, the flavor is at its best. Farmer’s Markets often pick produce that morning. Part of the reason they taste better is they are offered in season when soil is fertile, the air is the right temperature, and sunlight and water are perfect. More nutrients – we’ve covered that! Helps the economy by supporting farmers who reinvested in the community. Food safety is enhanced by reducing the number of steps between you and your food’s source thereby reducing risk of contamination in harvesting, washing, storing, shipping and distributing the food. Consider gathering your reusable grocery bags and heading out to winter and summer markets in your area. You’ll do the environment good by shopping local!